I've packed up all my stuff now and it's back to one big room again. Grace Harrison is next. See: http://www.42newbriggate.co.uk for info about her and the other residents. I don't really know why sheep, but I've made ten. Maybe they'll sail away on the boats and go to the imagined horizon of Bialystok. So okay I've gotten around to making the forth and final sheet of paper from my application. Phew, that's mine done, now what about all the rest of the paper? More boats? I think I need more time. Today I moved things around a lot, maybe cos I was stuck. In the end I made some boats out of the pile of letters. I cried and slept all weekend. I think being submerged in rejection may have something to do with it so today I'm going to get stuff done. The Rejection-Letter- Amnesty on Friday went really well and the contributions were just so incredibly diverse. They are hilarious, tragic and comforting. It's making me feel better already. The down-trodden masses were uplifted by the 'ambient' sounds made by Rus Pearson and Sean Foran all washed down with a choral rendition of audience rejection by Scott Senogles. The main objective of the event is to publicise, gather material, amuse the audience and, of course, liberate and empower the down-trodden masses. The audience were be invited to hand over material/documents of rejections, disappointments and personal slights by using questionnaires available on the night or by donating materials they bring along with them. The reward for this will be a drink of their choice. 6pm - 7pm: Improvised Jazz from Rus Pearson (double bass), Sean Foran (Electric Piano) and possibly Matt Bourne (Cello). Plus music focused on ruining epic compositional climaxes with unmemorable, pointless and plain-wrong musical conclusions. 7.30pm - 8pm: Stand-up style public reading/re-enactment of various rejections, with musical accompaniment facilitated by sculptor, organist and performance artist Scott Senogles (all 6 foot 7 of him). I've been making big sheets of paper from my own application. So far I've made 3 huge sheets and I think I have enough for one more. La la la, bye bye form. Also I've been thinking about Bailystock where I would have been for the Art Factory residency. I wonder what it would have looked like. I make my own landscape from the furniture in the gallery and draw it as a landscape. First from west to east and then from east to west. This will be my view now. When I was a kid we used to go to Dublin in the summer. We spent a lot of time walking around the city window shopping. I think that was the first time I say someone drawing on the pavement. I was awestruck by the skill of those artists and since then I've always harboured the desire to get some chalk and do it myself. Today was the perfect opportunity. Nobdy much had been paying attention to my residency in the past couple of days. I decided to rewrite my letter, the same one Rosie was delivering around town in pink on the ground and the one that was in the window of my display. At the start people just walked over me, but when I got a few sentences down people started stopping to read it and then to look in the window. A group of teenage boys stopped suddenly and stood around me. They questioned what I was doing. Slightly intimidated by their stance, but pleasantly surprised by their interest we struck up a conversation about what we do when we're bored and whether I would get in trouble for what I was doing. As abruptly as they arrived they departed and I continued writing. I got there and it was just me and the big room. Freya came in for a bit to pick up her stuff and we had some great chats which really got me thinking more about what I'm doing. Although right now less thinking and more doing is in order. I made a window display and then tried to figure out the video recorder. Then the water rate man came. It started to feel like my place then. I tore paper and moved things in the window a bit. Then Rosie came along. 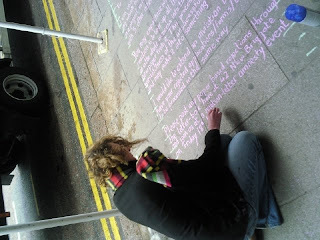 She is assisting with the project by distributing letters throughout Leeds. She's got some ace photo's which make me laugh. I think I'm feeling confined so we go out for a bit. When I get back I start to think about the ladies who stood outside before and talked about how there used to be a gallery but now it's just an office. Looking at all the paper everywhere I could see where they were coming from. I just feel so depressed that I'm stuck in a room and not exploring Bialystok like I could have been. I need to start making and stop thinking. I'm starting a residency in 42 New Briggate Gallery, Leeds tomorrow. It all began when I got an email in March 08 saying my application for a joint international residency at The Art Factory in Bialystok, Poland was accepted. Straight away I rang my friend Jaanika to share the news. After that I couldn't keep my mouth shut and I started telling everyone I knew. Wow, it was such an amazing opportunity! I had to get funding for it though, so I sought the advise of experienced and trusted colleagues and friends when putting together my application for funding. After several meetings and several drafts I sent it off. Six weeks of nervous anticipation ensued. I really started to visualise the experience. It was all I could think about. I cancelled all plans for July and August as I would be away. For my birthday I got a book called 'There's and egg in my soup' about an Irishman who goes to Poland. I practically had my bags packed. Then on the day I was to find out I waited for the post. Nothing. I made a call and they said it would be just a few more days. Well, I had waited this long, whats a few more days? Then Wednesday came. When I woke I just had this feeling in my stomach. I didn't want to know anymore, what if it was a no? Then at 4.30pm I finally got myself together and called them up. Gave my reference number and waited for the result. Silence, and then 'Miss Strain, I'm sorry...' I didn't hear the rest. I went for a walk, came home and cried whilst I hung up my washing. After a long sleep I woke up and knew what to do. I would tear up all the paperwork to do with this residency and make new paper from it. And while I was at it I would tear up all the other rejection letters and those of my colleagues and those of anyone who's put their heart into something and been knocked back. is in love with paper.